Your 6 month old baby can also have a balanced and friendly meal, very popular and appreciated by young and adults, with an excellent semolina as for adults. Our raw materials are selected with great care to feed your baby and help him grow well. chicken couscous compote by AGRO FOOD INDUSTRIE at Pakbiz.com a premier Business to Business marketplace and largest online business directory. 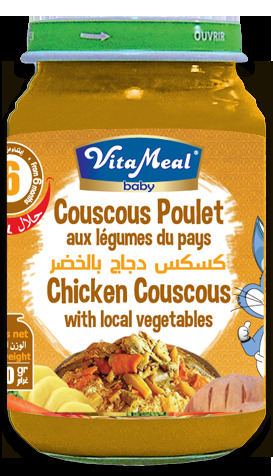 Find chicken couscous compote from Morocco complete basis & contact information, business offers, availability & related Food & Beverage products. This page gives you information about the authentic sellers of this product. It allows buyers and sellers communication directly. It can also facilitate the buyers to purchase the product in reasonable prices.